Reforming the Petition of Concern mechanism key to unlocking the potential of devolution, says Bradshaw. Reforming the Petition of Concern (POC) mechanism is key to unlocking the potential of devolution, Alliance MLA Paula Bradshaw has said. Ms Bradshaw said while the mechanism was an important tool in protecting minority rights, in practice it had often been used to block the delivery of rights, while frustrating progress. She added Alliance had first brought the idea of reforming the POC during previous talks to restore devolution. 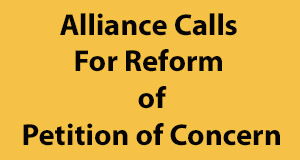 “Alliance put proposals on the table to reform the POC almost two years ago. The POC was designed to protect minorities. Instead, it has been used to frustrate progress, stop the Assembly from holding Ministers to account, and block the delivery of rights and equality. Reforming it is key to opening progression on a whole range of rights issues,” said Ms Bradshaw. “It is crucial when the Assembly returns, the POC would be no longer used to do what it has before. Instead, any future POC would be strictly limited to matters involving changes to the Assembly or constitutional matters, specific issues around identity and culture, or issues relating to the past such as legacy, victims and paramilitarism. “Under Alliance’s proposals, every POC would need to be signed and dated, excluding pre-signed forms, clearly state why the mechanism needs to be used and satisfy a member of a legal panel on how it meets the criteria.